Nowadays you can buy those inexpensive "onion-blooming" gadgets at your local grocery or discount store, but what do you bread your onions and onion rings with? 2. Dip flowering onion in a bowl of well-beaten fresh eggs until completely covered. 3. Bread above flowering onion in Atkinson's Flowering Onion Breader until completely covered. Shake off excess. 4. Fry at 350 degrees with root end of onion up for approximately 2 minutes. Turn root end of onion down and fry for approx. 2 minutes or until golden brown. Use the same breading process for onion rings and fry until golden brown. 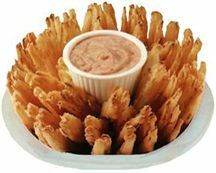 Use what the pros use, Atkinson's Flowering Onion and Onion Ring Breader!